It has announced that Dulux Academy is the winner of the 2018 On the Tools Training Excellence Award. 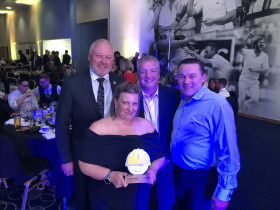 The awards, which celebrate and reward construction workers, sub- contractors, tools and equipment manufacturers and construction companies from across the UK, were held at Edgbaston Cricket Ground, Birmingham. All entries for the awards are independently judged by a panel of industry experts - On The Tools is the No1 social site for tradespeople to watch videos, read articles and share content, with more than two million followers on Facebook, Instagram and twitter. Dulux Academy Manager, Vickie Mather said: “This award coincided with our four year anniversary of starting work on the concept that is now known as Dulux Academy. “In that time, we have welcomed more than 4,500 professional painters on to our courses ranging across every aspect of decoration including spray, wallpaper, colour selection, first aid and social media at our flagship Slough facility and across our network of college partners. The On the Tools awards, hosted by comedian Justin Moorhouse, handed out a total of 25 awards, including recognition of excellence in individual trades.